We all know we’re not supposed to text while driving. But how about texting someone you know is driving? You’d better not do that either, or so warned a New Jersey appeals court – you could be held responsible for a resulting accident. In September 2009, 18-year-old Kyle Best drove his pickup head-on into a pair of motorcyclists while responding to a text. Seeking compensation for their injuries, the motorcyclists wound up suing not just Best, but also Shannon Colonna, his then 17-year-old girlfriend who sent the fateful text. Best wound up settling out of court. Colonna won her case, but the victims of the crash appealed the verdict. This week, the judges reviewing the case ruled that had Colonna known Best was driving at the time, she too could be held responsible for the crash. "We hold that the sender of a text message can potentially be liable if an accident is caused by texting, but only if the sender knew or had special reason to know that the recipient would view the text while driving and thus be distracted," the appeals court said. The three-judge panel ultimately wound up siding with Colonna. They say they found no evidence that the habitual texter knew her boyfriend was driving at the time. Predictably, the court’s stance has put many New Jerseyans on edge. Governor Chris Christie told a statewide talk radio station this week that he believes the driver of the vehicle bears full responsibility. After all, just because you know someone is driving doesn’t mean you know that person will immediately read your text in that unsafe environment. The appeals court opinion only adds to New Jersey’s reputation for being one of the strictest states in the nation when it comes to distracted driving. 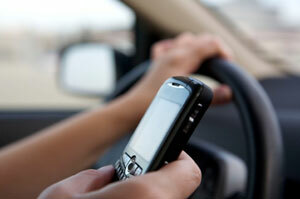 Those who injure another person as a result of distracted driving in the state can face up to 10 years in prison. And earlier in the year, State Sen. James Holzapfel proposed a law that would allow the police to search your phone after an accident if texting is suspected. Holding the sender culpable, whether they knew the receiver was driving or not, is wrong on so many levels. The main one is that the receiver is NOT required to immediately read or respond to a text, or phone call, whatever s/he is doing. If I am cooking, I don’t answer the phone—I am BUSY, as in otherwise occupied. Since texting and using a hand held phone while driving is illegal - at least where I live - the RESPONSIBLE thing for a driver to do is to turn off the device. Some people put it in the trunk of their car to avoid temptation.